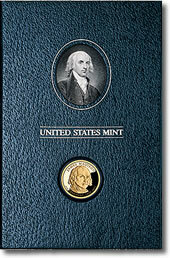 Today the U.S. Mint released the James Madison Presidential $1 Coin Historical Signature Set™ for a price of $19.95. The proof coin is brilliant, with a sharp relief and mirror-like background. The frosted foreground gives a special cameo effect. As a side note, the Bureau of Engraving and Printing is responsible for printing U.S. currency. The previous three $1 Coin Historical Signature Sets featured George Washington, John Adams, and Thomas Jefferson.